The mythological story of Jason is synonymous with adventure and great feats of heroism. This tapestry belongs to a cycle of seven works relating the story of Jason's voyage with the Argonauts; their quest to capture the golden fleece, and their subsequent return to Greece. Particular emphasis is placed on one aspect of the story that is seldom explored: Jason and Medea.The cycle was woven in the celebrated Gobelins workshop to cartoons by François de Troy. In this scene, Jason is swearing eternal fidelity to Medea, clasping her arm as she hands him the little parcel of herbs that will help the prince defeat the bulls of Mars. The scene takes place in a leafy glade, where Medea has come to worship at the shrine of Hecate, the Goddess of sorcery. De Troy included an allegorical figure of love, drawing his bow, with the arrow being directed by Hymen, the God of marriage, towards Jason's heart; this was to reinforce to the viewer, the solemn and conjugal nature of the vow Jason has made to Medea. Medea is shown to be completely absorbed in Jason's act of love, reaching carelessly with one arm to gather the herbs for her lover, an act that constitutes a betrayal to her parents and countrymen. "There shall be a bridal bed for you, which you and I will share. Nothing shall part us in our love till Death at his appointed hour removes us from the light of day". Jason swears eternal fidelity to Medea, clasping her arm as she gives him the herbs that will help the prince defeat the bulls of Mars. The scene takes place in a leafy glade, where Medea has come to worship at the shrine of Hecate, the goddess of sorcery. De Troy included an allegorical figure of love, drawing his bow, with the arrow directed by Hymen, the God of marriage, towards Jason's heart; this was to reinforce to the viewer, the solemn and conjugal nature of the vow Jason has made to Medea. Medea is shown to be completely absorbed in Jason's act of love, reaching carelessly with one arm to gather the herbs for her lover, an act that constitutes a betrayal to her parents and countrymen. The leafy undergrowth, the altar enclosing the two lovers, and Hecate's shaded statue, are all details which alert the viewer to the lovers' seclusion, and to the darkness of witchcraft, within which field Medea's talents lie. The expressive treatment of Jason and Medea's robes heightens the romantic tension, while the dog in the left-hand corner, a symbol of fidelity, is a further allusion to Jason's vow. "Jason engage sa foi à Médée qui lui promet les secours de son art." "In 1787 these seven tapestries were given by the State to the Comte de Vergennes, Minister of Foreign Affairs from 1774, on the occasion of the successful completion of a commercial treaty with England. The set was, between the years 1800 and 1820, purchased by William Murray who succeeded in 1796 as 3rd Earl of Mansfield of Caen Wood, Co. Middx. The set probably hung at his house of Caen Wood, now know as Kenwood, until its sale about 1870 by William David Murray, 4th Earl in 1840, to Mr. Michael Thomas Bass, father of the 1st Lord Burton." According to Fenaille, eleven cycles and several individual scenes (79 tapestries in total) were woven at the Gobelins. This does not include the cycles that constituted private commissions for the royal palaces and diplomatic gifts for foreign dignitaries. Though it was expected that tapestry cycles would be re-woven, as and when required, the popularity of de Troy's story of Jason cycle was clearly such that it led Jean-Baptiste-Marie Pierre, director of the Gobelins in 1783, to remark that the subject had been 'done to death' (letter dated 11 February 1783, cited in Leribault, 2002, p.104). Today, Windsor Castle has all but the first two of the tapestries from the cycle; they are all signed 'de Troy à Rome'. They are variously signed and dated 'Cozette' and 'Audran', with dates ranging from 1744-1784. The Draper's Hall, in London, has four tapestries from the cycle. In France, the château de Compiègne has a set of six, while the châteaux de Versailles have two (Jason removing the golden fleece and Medea's flight). Henry Marillier noted that the Grand Dukes of Baden had a set of six. These were at one point hung in Schloß Mannheim: they appear in a photograph taken in 1900 of the throne room in the castle, in the 1995 Sotheby's sale catalogue of the ducal collection. They do not appear in the sale, and as the family's previous sale took place in 1808, they are now presumably in one of Baden-Württemberg's museums. Marillier also indicated that the Palazzo Reale in Milan had a set of six; the Swedish royal collection had 5 at Drottingham, with the remaining two in Stockholm. Marillier also states that Edward Cecil Guiness, 1st Earl of Iveagh, had four from the cycle: Jason and the bulls of Mars; Jason and the men of the serpent's teeth; Jason weds Creusa/Medea and Creusa consumed by the poisoned robe. As the Earl of Iveagh purchased Kenwood House in 1925, is Marillier confusing Guiness's set with that of Lady Burton's, purchased in 1870, but which was also originally at Kenwood House? Guiness had a particular penchant for tapestries, so perhaps his set was hung at another of his private residences - Farmleigh or his London home at Hyde Park corner. Much of Guiness's collection was left to the state, so it is difficult to discern the cycle's current location, however it does seem an extraordinary coincidence. 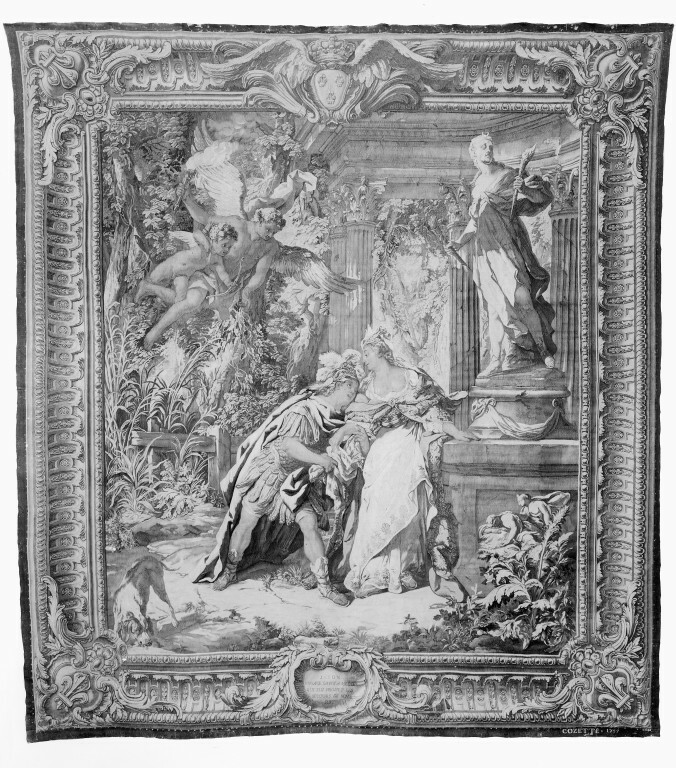 The Hermitage have the same tapestry, signed by Cozette and dated 1784. The Draper's Hall have another version. Historical significance: Though the cycle was woven in great numbers, it is rare to have a complete set. 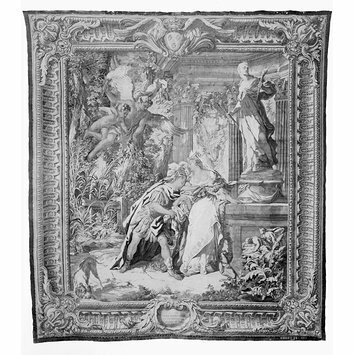 Woven in the Gobelins, in the high-warp workshops of Cozette and Audran, with compositions designed by de Troy, this cycle constitutes the very best of tapestries executed in France during the eighteenth century. This cycle of tapestries was woven during the golden age of French tapestry. In the eighteenth century, the Gobelins factory underwent a renaissance, having already flourished under the masterful stewardship of Charles Le Brun in the preceding century. The factory benefitted greatly from developments in dyes and increasingly rococo designs, the resulting tapestries boasting vivid colours and more light-hearted subject matter. The contemporary success of theatrical productions of Longepierre's Medée (adapted since its initial, disappointing début in 1694) had contributed to a renewal of interest in the figure of Medea, and this no doubt influenced De Troy's choice of subject for the tapestry cycle. De Troy took Book VII from Ovid's Metamorphoses as his source for the seven cartoons, supplemented by references to Seneca and Euripides. (Leribault, 2002, p.101). wool and silk, 1759, French; The Story of Jason, Jason swearing eternal affection to Medea, Gobelins, Cozette, De Troy. Guiffrey, Jules, Histoire de La Tapisserie:depuis le moyen âge jusqu'a nos jours, Tours: Alfred Mame et Fils, 1886, p. 416. Coural, Jean, Les Gobelins:Trois Siècles de Tapisserie, Paris: Ministère des Affaires Culturelles, 1966, p. 35. Fenaille, M., Etat Général des tapisseries de la manufacture des Gobelins, Paris, 1903 à 1923, pp. 109-35. Göbel, H., Wandteppiche, die Romanischen Länder, Vol. II, Leipzig, 1928, pp.164-165. Marillier, Henry C., Marillier tapestry subject catalogue, London:Victoria & Albert Museum, 1989, vol. Mythology A-L, pp.124-126. Leribault, Christophe, 'Médée contre Créüse', in Mélanges en hommage à Pierre Rosenberg: Peintures et dessins en France et en Italie XVIIe - XVIIIe siècles, Paris: Editions de la Réunion des Musées Nationaux, 2001. 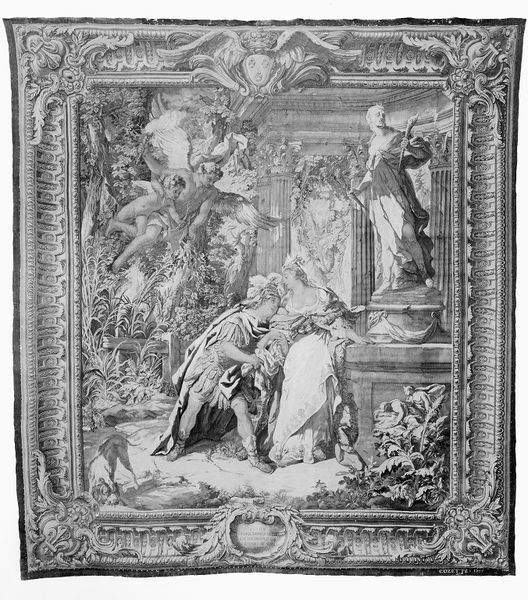 Leribault, Christophe, Jean-François de Troy 1679-1752, Paris: Arthena, 2002, pp.101-104; pp.378-382. Thomson,W.G., A History of Tapestry: from the Earliest Times until the Present Day, Yorkshire, 1973, p. 446. Lot 322 in the Fine English, continental and Oriental porcelain, French ormolu-mounted objects of art, important French furniture and Gobelins tapestry sale, 22-24, November, 1950, Christie's, London.